This incredible bond between our pets and their people is no surprise to our readers who have loved an animal. Many of us use a childhood pet’s name as part of a security password. And we truly grieve when a beloved pet passes away. Evidence of the power of this bond is all around us. The internet is full of photos and videos that pull at our heartstrings as pets and humans interact, sometimes in a surprising way. We have heard stories in our practice about a dog that could sense an owner’s asthma attack coming on and rubbed its owner’s face as an alert, a client that suffered from depression until she adopted a cat that gave her comfort, and most dramatically, a small Shih Tzu mix that was taken to the hospital bed of his teenage companion who was in a coma from a traumatic head injury. The patient woke up as the dog wagged in excitement to see his girl. When our daughter was expecting her third boy, she and her husband received the diagnosis of Down syndrome. We awaited Henry’s birth with some trepidation, not knowing what his future held in store, but knowing that love and support would always be a part of his life. Some of that support came from an unexpected source: his grandparents’ Golden Retriever, Robby. From the time Henry was an infant and his family visited from out of state, Robby was a constant, quiet presence at his side. When Henry became mobile and began to move around the house, Robby would follow. If Henry approached the stairs, the dog would look around anxiously as if to say, “Hey! Are you watching this boy? !” Robby loves all kids that visit, but he sensed very early on that one special little guy needed an extra measure of care. And now here is the story behind the accompanying photo. The Christmas that Henry was one, he was able to move around the floor, but unable to escape the sloppy kisses from Robby. 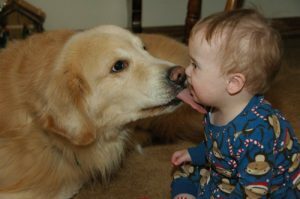 Dr. Andrews snapped this shot at the perfect moment that doggy tongue met baby face. We all recognized the special quality of the image and our daughter submitted it to the National Down Syndrome Society (NDSS) as part of their New York City Buddy Walk event. The photo was chosen as one of a group to be shown on a big screen in Times Square before the walk in Central Park later that day. A few weeks later, Weekend Today asked viewers to send in favorite photos for a segment they were calling, “Pictures of our Lives.” The photo was submitted, and what a surprise to see it among twelve other images one Sunday on national TV! What lovely stories of Henry and Edmnud and the love exhibited by Robby and Klaus!! Yes I agree pets are such a HUGE part of our lives and our love! They are so intuitive. Thank you for sharing these wonderful stories! I love the blog entries!! Keep them coming! !